Anyone visiting the Albury-Wodonga area can get up to date reports on fishing in the area from Fish Talk, Thursday evenings from 7.00 - 9.00 pm on Ten 73 Border FM. The show is in talk-back format and covers most of the locations on this site. Listeners can compete for weekly prizes including books, lures and accommodation at local fishing destinations. 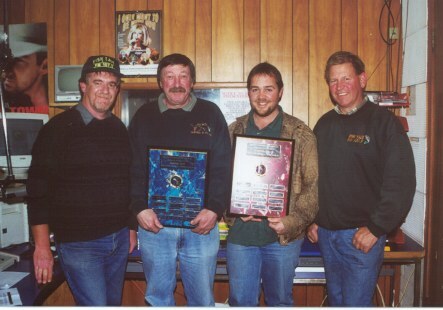 The Fish Talk crew competed in the inaugural Media Freshwater Fishing Challenge at Dartmouth in March 2000, winning the champion team and champion angler trophies. In July 2000 they also won the Twin Rivers Bream Classic, on the Tambo and Nicholson rivers in East Gippsland. From left, Ross Hogan, Laurie Moretti, Jamie Gay and Don Blackwell.